The year 2016 was the hottest year in Legal Tech and 2017 was all Blockchain. This year was about the investments. And that may have been a distraction. Fact is, 2018 was pretty weird and much of it was caused by the enormous injections of capital into the industry. It also revealed the investors behind the scenes fueling the fans of LegalTech. However, news about the funding rounds has diverted attention away from numbers that would have cause to dampen our exuberance. Contracts won the popular vote. In our charts, we kept track of new startups created each month since 2010. 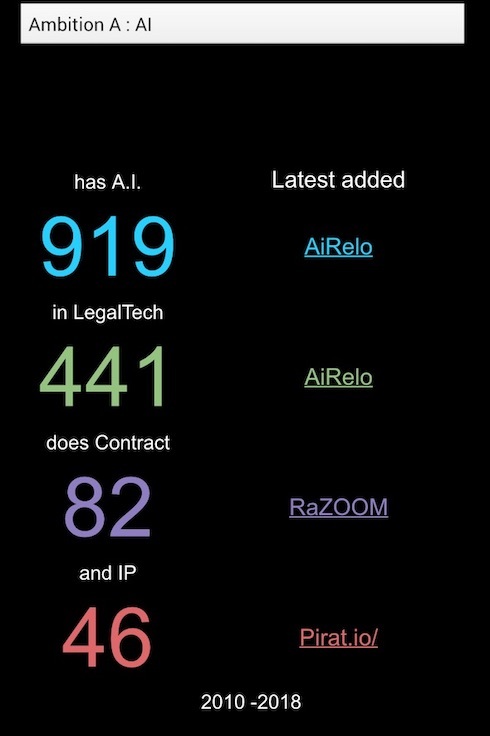 We’ve been enjoying steady growth of new legal startups up until 2016. This year we dropped near the 2013-14 levels as you can see in our animation below. The metric that actually made us aware of the steady decline was the number of mutations we perform on the dataset every year. In 2017 we performed 4184 mutations on the data which translates to 11.5 changes a day. The majority of the mutations consist of adding new companies, the rest was updating existing listings. This year we had 2722 mutations in total which translates to about 7.5 changes a day. This 35 % reduction cuts across most markets except for two: RiskTech and CivicTech. CivicTech doubled in size this year probably inspired by the #MeToo movement and the US midterm elections. In RiskTech, the main driver could be the fact that these companies receive more investment on average than any other type of venture impacting the legal industry. They say: an ounce of prevention is worth a pound of cure. 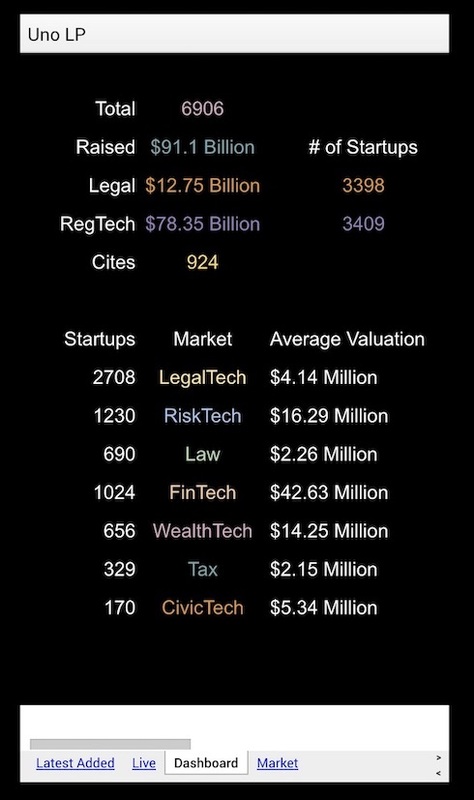 The chart below illustrates this disparity between LegalTech and RiskTech in terms of average worth each year since 2010. In 2017, the biggest splashes were made by LegalTech companies supporting the entertainment industry by managing copyrights. This year’s bright spots was on services who managed legal documents for a broader customer base. At closer inspections of the companies receiving cash and clicks this year, we notice they literally revolve around the management of contracts. Let’s face facts, our reality is dominated by misinformation and the sad truth is that it is mostly by our own design. In order to keep us enthralled, companies increasingly create fake doors, concierge services, use slick demos and content to test markets and experiment with business models. Blockchains startups used these techniques to the extreme to prop up demand for their initial coin offerings. And Artificial Intelligence startups aren’t angels either. The magic we witness most often belies the fundamentals of the technology required to build these concepts. With A.I. in particular, the principles underlying its creation puts it only within reach of a couple of companies and nation states. In contrast, Blockchain is blue-collar tech that can legitimately finance itself. I’m therefore so saddened by the greed destroying its credibility. The premise of Blockchain has more real value than the promise of Bitcoin. 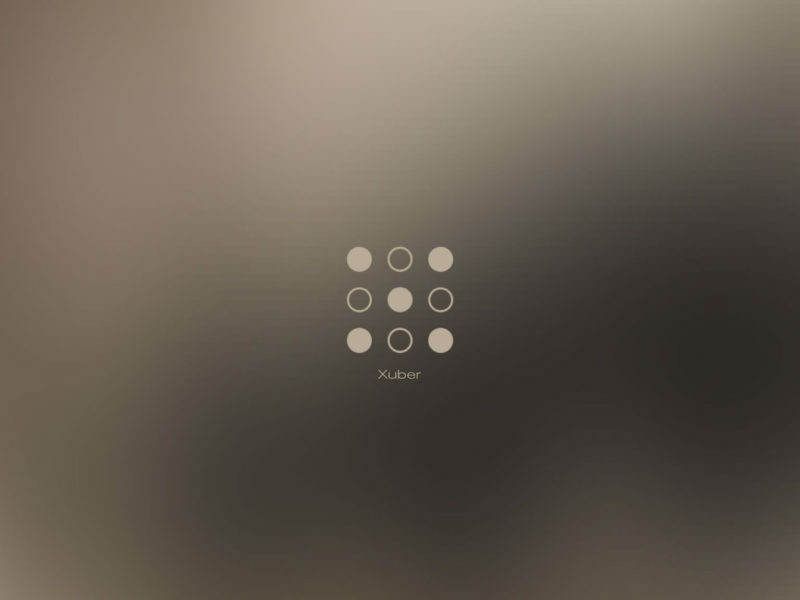 In short: while many can do blockchain, only a few have the funds, talent, and data to do A.I. We’ll always applaud the magicians that get to pull off “A.I” and make us believe. And Legalpioneer will be the first to seek front-row tickets to that show. But hey, it’s 2018 so let’s not dwell too much on facts and celebrate the little discoveries that delighted us this year. Found our first A.I. research platform in Africa called: Judy. Bots are on the decline throughout the tech industry except for a curious new species called: Telegram Bots. We found about 9 LegalTech Bots on Telegram originating from Moscow and Kiev. Netdocuments (Software company) acquires Chapman and Cutler’s (Law Firm) Closing Room deal management application (Software). Elevate (Software company) secured investment from Morgan Stanley (Financial Institution) and went on a spending spree to acquire Lexpredict and Sumati for contract lifecycle, mitigation, and diligence capabilities. These storylines exemplify how surreal the legal industry has become and may signify the direction we’re heading. However every year, the universe shuffles our deck of expectations, deals us a new hand of assumptions, dares us to play the prediction game and asks: wanna bet? Therefore next year I suggest we rely more on data and facts. I hope to see more growth in LegalTech. But above all else, I wish you all a prosperous year with lots of magic. And here’s how you properly rewind an extraordinary year: just click on the “Previous post” below and keep clicking until you get to the 2017 Review.